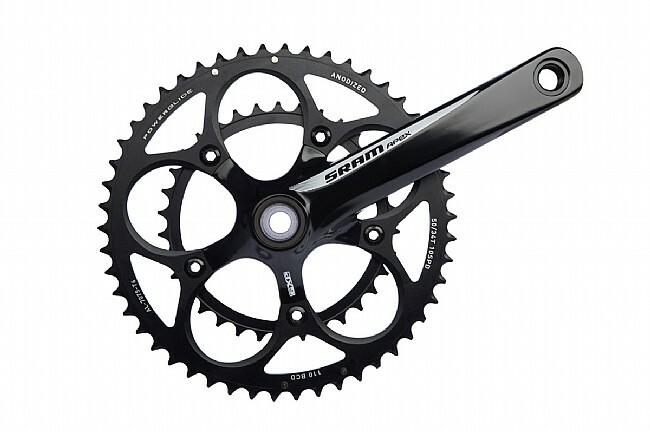 The Apex crankset is now available with jet black chainrings for a totally streamlined look. SRAM's budget-friendly design is also part of SRAM WiFli (Wider, Faster, Lighter) approach to the bicycle drivetrain. This means that with the Apex compact crankset, a long cage rear derailleur, and an 11/32 cassette, you can achieve the gear range of a triple with less weight and gearing redundancy. The Apex crank features forged 6061 T6 aluminum arms for light weight and maximum stiffness. Hard anodized 7075 T6 chainrings with powerglide tooth profiling ensure smooth shifting and long life. The Apex Crankset is available in Black with White logos to perfectly match both the Black and White versions of the Apex groupset. An English threaded GXP bottom bracket is included. 10-Speed SRAM/Shimano compatible. 881 grams (172.5; weighed with included bottom bracket which adds 109 grams). Common issue, my bike came with a problematic FSABB that is very costly to replace and still problematic. The Apex crank comes with the necessary BB and within minutes I was back on the bike. Even adding the cost of tools I saved a lot money by switching to SRAM and the black cranks look better. I purchased this crank for a Soma Double Cross Disc build for the 2014 Cornhusker State Games Gravel Grinder. The crankset is great, the build fetured an all-SRAM drivetrain (SRAM Apex crank, all else is SRAM Rival) that shifts like a dream. However, the provided SRAM bottom bracket is very poorly executed. Within 500 miles of training in dry, dusty conditions, it required pulling and re-greasing of the crank spindle to quiet a ticking that had developed. This ticking returned after 400 miles. Ultimately, I replaced the BB with a Chris King bottom bracket, at considerably more than the crank cost. Light, strong and cheap... I'll take all three please. No perceived flexing in the arms and not terribly heavy! With 110 bcd becoming much more popular, this is a sound choice for ensuring future compatibility. Built my cross bike with an APEX group. Definitely not the lightest groupset around but it is what you'd expect for the price. I did not want to spend a lot of money on the assumption that it will have a short life. However, I am very happy with it. The front and rear shifting is very smooth and easy to adjust.